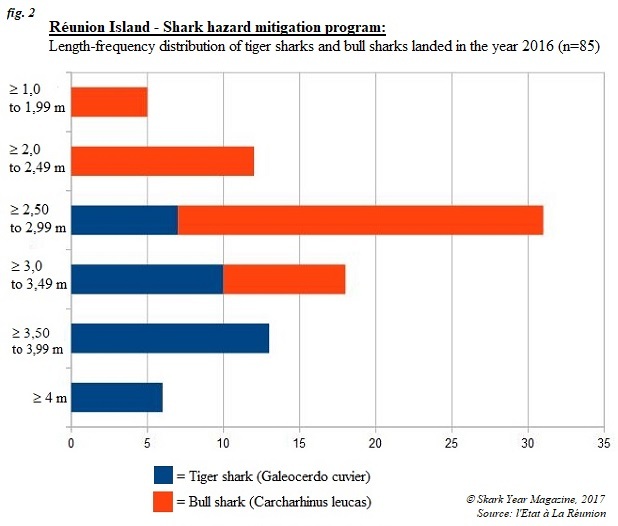 In 2016, a total of 85 specimens were killed in the fishing program for shark hazard mitigation off the western coast of Reunion Island – 49 of them were bull sharks (Carcharhinus leucas) and 36 were tiger sharks (Galeocerdo cuvier). The details on each specimen are provided in Table 1. below. The catch numbers have almost doubled in comparison to the 47 specimens wich were landed in the previous year (see 2015 summary here). A 4,40 metres long tiger shark was the biggest specimen in the 2016 season. The catch of the female tiger occurred in Saint Paul Bay in late March. The biggest bull shark, which measured 3,10 metres in length, was also caught in the waters of Saint Paul Bay in early August. Only a minority (20%) of the shark catches consisted of relatively small specimens, with a body length of under 2,50 metres (see fig.2). 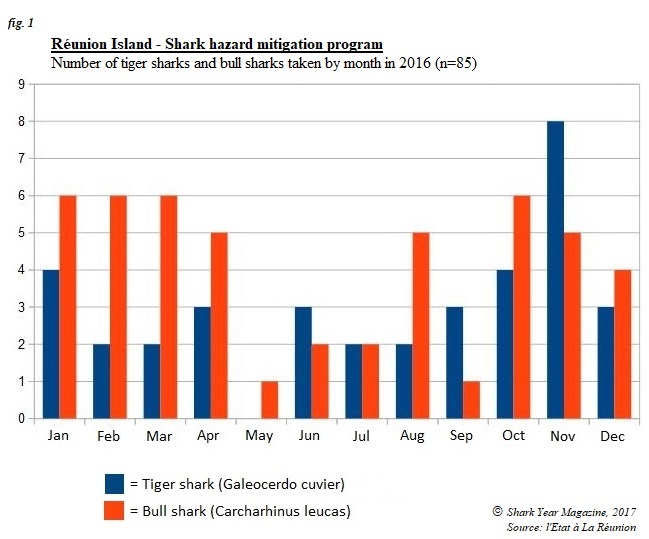 November turned out to be the most productive month with 13 captures (8 tiger and 5 bull sharks), while the lowest catch rate was recorded in May (1 bull shark).